The actor Nakamura Shirobê held the name of Nakamura Nakasuke I from the 3rd lunar month of 1808 to the 8th lunar month of 1811. The actor Nakamura Tôzô IV held the name of Nakamura Nakasuke during the first half of the 1830s but he was never acknowledged as an official name-holder. The actor Nakamura Kashichi IV held the name of Nakamura Nakasuke II from the 11th lunar month of 1853 to the 12th lunar month of 1866. Born the 21st of March 1889. Son of Nakamura Kan'emon II (and elder brother of Nakamura Kan'emon III), his first stage name was Nakamura Umenosuke II. 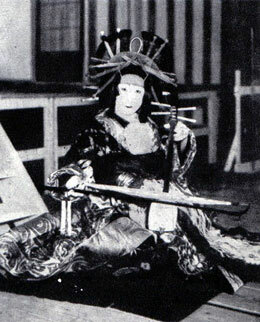 He made his debut on stage in Tôkyô in 1896 at the Ryûseiza. He became a disciple of Seki Sanjûrô V and received the name of Owariya Umenosuke in October 1910, when he performed with his new master at the Hôraiza (his younger brother received the name of Seki Hananosuke). He joined Nakamura Shikan V the next year and took back the name of Nakamura Umenosuke II in October 1911. Nakamura Umenosuke II and his younger brother Nakamura Umemaru respectively took the names of Nakamura Kamon I and Nakamura Umenosuke III in November 1911 at the Kabukiza; they performed in the special programs celebrating the shûmei of Nakamura Utaemon V. Kamon kept on performing in koshibai during the 1910s, 1920s and the first half of the 1930s, where he could perform great onnagata roles like Princess Yaegaki in "Jusshukô", Akoya in "Akoya" or Otomi in "Kirare Yosa". He finally took the name of Nakamura Nakasuke III in November 1936 at the Kabukiza and held it up to his death the 23rd of February 1941. He spent his final years in ôshibai, performing supporting roles. He did not join the Zenshinza troupe when it was created in May 1931 by his younger brother Nakamura Kan'emon III and Kawarasaki Chôjûrô IV. Nakamura Nakasuke III playing the role of Akoya in the eponymous drama "Akoya"
The actor Nakamura Genzaemon II held the name of Nakamura Nakasuke IV from March 1955 to June 1964. Born the 13th of May 1950. He graduated from the Actors Training Center of the National Theatre (first graduation) and made his debut on stage in April 1972 at the National Theatre, performing the role of a soldier in the drama "Ichi-no-Tani Futaba Gunki". He became a disciple of Nakamura Kanzaburô XVII and received the name of Nakamura Nakasuke V in June 1973 at the Kabukiza, where he played the roles of a watchman and a young samurai in "Edo no Yûdachi" and "Tange Sazen". He became nadai and celebrated the event in January 1987 at the Kabukiza, where he took the name of Nakamura Kannojô III and played the roles of the wakashugata Kotaki and the villager Kannojô in the dramas "Saruwaka Edo no Hatsuyagura" and "Kadonde Futari Momotarô"; the latter drama was the hatsubutai of both Nakamura Kantarô II and Nakamura Shichinosuke II. 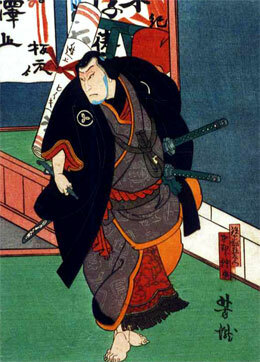 Successively disciple of Nakamura Kanzaburô XVII and then his son Nakamura Kanzaburô XVIII, he is now at the service of the 3rd generation of masters of the Nakamuraya guild. Born the 16th of September 1965. He started his career as a disciple of Nakamura Kankurô V in June 1991 at the Shinbashi Enbujô, where he received the name of Nakamura Nakasuke VI and played the role of a bonze in the drama "Togitatsu no Utare". He stopped acting and quitted the Kabuki world in Summer 2000. Born in 1991. He graduated from the Actors Training Center of the National Theatre (20th graduation) and started his career as a disciple of Nakamura Kankurô in April 2013, receiving the name of Nakamura Nakasuke VII.